Black 14 oz. 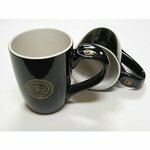 ceramic mug with Manchester University seal on the front of mug. Also has the crest logo on the handle, too.